Krishna Greens North Pride- Aalur Duddanahalli Crossing,This project is being planned at Aalur Duddanahalli Crossing and is situated in Duddanahalli village. 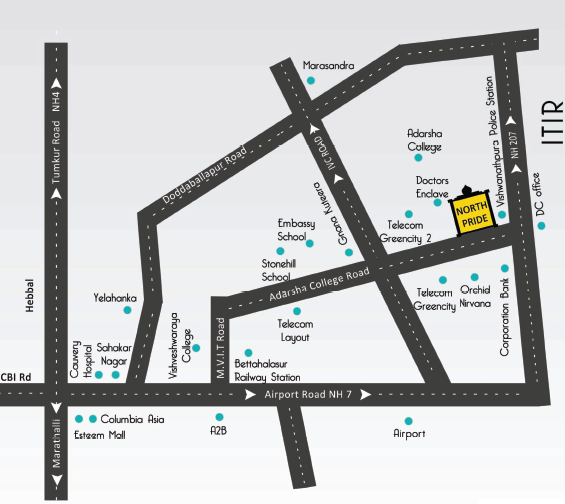 Located just opposite to the new rural DC office and right next to National Highway 207. At Krishna Greens North Pride, you can enjoy excellent connectivity as it is located close proximity to Airport, which is witnessing a surge of economic activity. plot is close leading academic institutes, entertainment, commercial and sports establishments. Offering an unmatched geographical advantage for IT professionals. Great amenities supplied with underground electrical supply lines, sufficient capacity water tank, spacious playground for your children to relax, well planned water source, swimming pool, club house, park and best security service. Leisure, shopping, healthcare and even your children’s school, everything you could possibly want is right here in your new neighbourhood. Registration Charges extra as per government guideline values. The booking of a plot in Krishna Greens North Pride will be accepted once the amount of Rs.1,00,000/- paid as the down payment. The remaining balance amount must be paid in monthly instalment as per the given payment chart. Time required for completion of layout will be about 60(Sixty) months. Allotment of plot will be done on the first-come, first-served basis. The members who are interested in booking of the site can make the payment in favour of "THE BANGALORE EMPLOYEES AND SELF EMPLOYEES HOUSING CO OPERATIVE SOCIETY LTD" through cheque/DD/NEFT/RTGS only. Krishna Greens North Pride is located in Aalur Duddanahalli Crossing, Adarsha college road Aalur Duddanahalli Crossing, 0.6 KM from Vishwanathapura Police station, 1 KM from national highway 207, near to IVC road.